When you’re running a small business, it can be difficult to know who to turn to for help with your finances. As the terms "bookkeeper" and "accountant" are often used interchangeably by the general public, business owners can understandably become confused about which one they actually need. This article explains the differences between a bookkeeper and an accountant, and how you can leverage both to your business's benefit. There are some crucial differences between bookkeepers and accountants. A bookkeeper is generally involved in processing and organising your business’ day-to-day financial operations. This means that bookkeepers can help with things such as issuing and recording invoices, booking expenses, reconciling bank statements, and paying suppliers and creditors. Some bookkeepers may also offer to complete your business’ VAT returns if you are VAT-registered, complete basic self-assessment tax returns, and may also offer to manage your payroll. An accountant, on the other hand, can offer more complex compliance services, such as preparing and filing a business’ tax returns and accounts. Crucially, accountants can also provide strategic advice to business owners, including tax planning services, cash flow reviews, and a review of your business’ overall performance. Due to the more technical nature of the work accountants provide, they tend to cost more than bookkeepers. Although there is some overlap between the work of accountants and bookkeepers, most business owners can benefit from using both a bookkeeper and an accountant to manage their business’ financial affairs. When should I call a bookkeeper? Generally, many small business owners find that they can manage their finances themselves during the initial stages and feel comfortable using cloud-based accounting systems, such as the one offered by AccountsPortal, which offers real-time reporting and is accredited by the Institute of Certified Bookkeepers, the world's largest bookkeeping institute. However, once a business has started to grow, it may be worthwhile enlisting the help of a professional bookkeeper, even on a part-time basis. Bookkeepers should be able to process financial transactions and settle invoices much quicker than you would be able to. In turn, this should free up more time for you to focus on running other areas of your business. What’s more, a bookkeeper can continue using the same accounting software that you already have, so hiring a new bookkeeper does not have to mean a transition over to new software. AccountsPortal, for example, lets you add an unlimited number of users, so it’s simply a case of adding your bookkeeper to the access list. When it comes to how often you should use a bookkeeper, the answer is really up to you. If you prefer to have your finances as up-to-date as possible, it may be worthwhile having a bookkeeper work on your financials on a weekly basis, to make sure everything is in order. If you have fewer transactions to process or have limited operations, then a bookkeeper could work on your books on a monthly basis. If you’re unsure, ask your prospective bookkeeper for advice about how often they think they would need to work to get your business’ financials in shape. Also, remember that some bookkeepers work remotely, while others are happy to come into your office and work from there, so it’s a case of looking around for a bookkeeper that is familiar with your accounting software and is happy to follow your working practices. When would an accountant fit the bill? An accountant is great to use at any point throughout your business journey. For example, if you are just starting out your business, an accountant can provide advice as to how you should structure your business, the best ways to extract profits from your business, and can also provide input when it comes to putting together your business plan. Equally, even once your business is established, accountants can help provide advice when it comes to business expansion and tax matters relating to a large asset acquisition. Crucially, accountants are also a useful port of call when it comes to any tax-related queries you may have. Often, accountants can provide advice as to whether your business should register for VAT, and they can also provide information on any relevant tax reliefs or deductions that your business can claim. When it comes to how often you’ll see an accountant, you will generally meet with them less frequently than you would with a bookkeeper. Generally, accountants get involved at specific times during your financial year – for example, when quarterly VAT returns fall due or annual tax returns and accounts need to be prepared and filed. If your business is large enough, however, you can have accountants work year-round for your business, effectively operating as an outsourced finance department. In summary, it’s best to go to a bookkeeper when you need help with the administrative side of your finances and to reach out to an accountant when you need more technical advice, or when your business starts getting larger. If you prefer to have all your service providers under one roof, there are also accounting firms that offer bookkeeping services, which can make things easier by providing a single contact for all your financial needs, while also making sure that the bookkeeping and accounting teams are working in harmony together. When choosing an accountant, it’s important to look for a chartered accountant. Preferably, they should have completed their training with one of the UK’s chartered accountancy bodies and will have the initials ACA, ACCA, ICAS or CIMA as recognition of their qualifications. The reason why finding a chartered accountant is so important is because the term accountant isn’t a regulated title. This means that anyone, regardless of their knowledge or experience, can set up an accountancy practice and claim to be an accountant. So it’s worthwhile doing your due diligence and making sure that your accountant is properly qualified to advise you about your business’ financial affairs. When choosing a bookkeeper, the scene changes slightly, as not all bookkeepers have formal qualifications to highlight their skills. However, there are bodies that offer bookkeeping courses, such as the Institute of Certified Bookkeepers (ICB), the International Association of Bookkeepers (IAB) and the Association of Accounting Technicians (AAT), if you would prefer to hire a bookkeeper that is accredited with one of these institutions. Overall, when deciding which bookkeeper or accountant to hire, think about their qualifications and experience, but also consider factors such as their cost, their reputation, and whether they have experience working for clients in your industry. Equally, if you’re having trouble finding a good accountant or bookkeeper, ask around and see whether other small business owners use anyone that they would recommend. The best way to determine whether you need a bookkeeper or an accountant is to look at the needs of your business. If you’re struggling with keeping up basic financial recording and often find it difficult to manage your invoices, payment cycles, or daily transactions, then it might be time to get a bookkeeper on board to help. Equally, if you’re looking for more technical advice, or need help completing your annual accounts, then an accountant can step in and assist. Often, businesses find that they will need to enlist the help of both a bookkeeper and an accountant at some point during the business’ life. 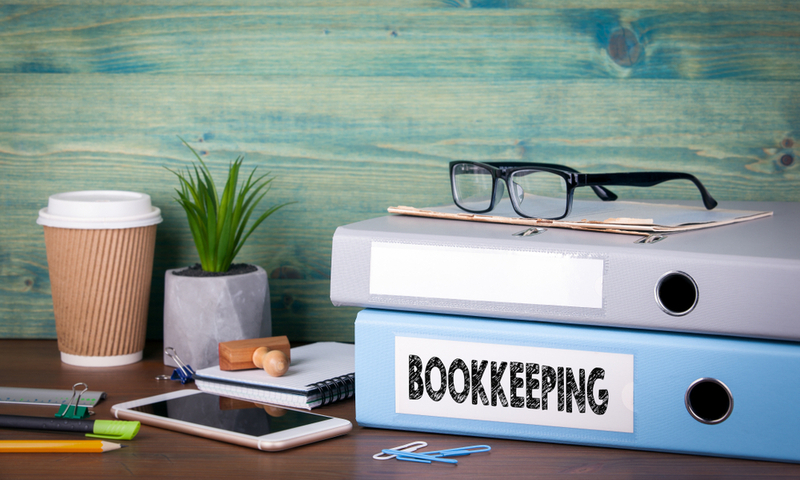 When it comes to hiring your chosen bookkeeper or accountant, try to think about whether you would rather just hire an accounting firm that also offers bookkeeping services, or whether you’d prefer to keep the two separate. Also have a think about the qualifications and experience that they offer, along with the overall cost of their services. Once you have settled on your chosen bookkeeper, you may also think about what accounting software you’d like them to use. AccountsPortal offers an easy-to-use accounting software programme that lets you create your own invoices, handle your VAT, create your own purchase orders, and much more.